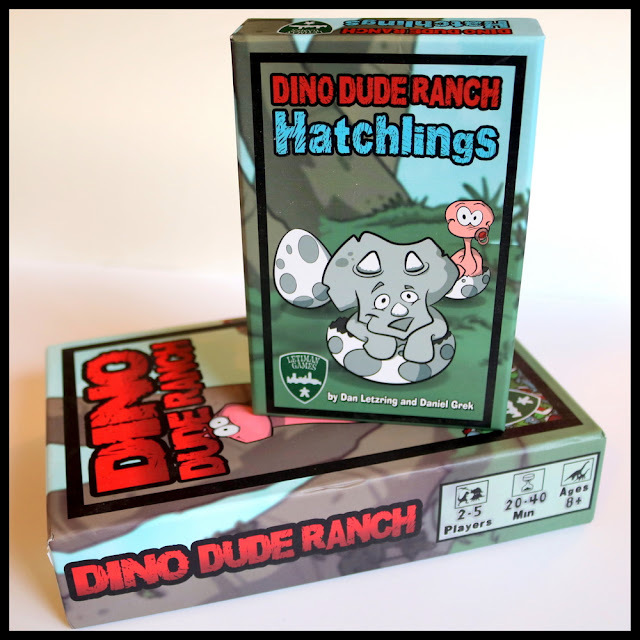 Dino Dude Ranch: Hatchlings is an expansion to 2016's light dice rolling and set collecting family game, Dino Dude Ranch. 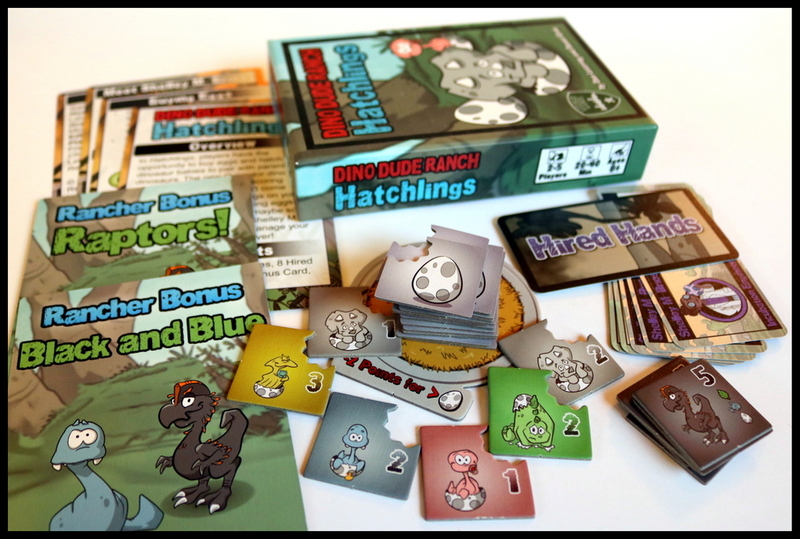 The original game is all about capturing a herd of wily dinosaurs and bringing them back to your ranch, one by one. 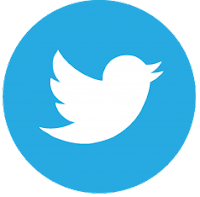 The expansion adds the ability to buy eggs, which can be hatched into baby dinosaurs or used for food to lure in the rare Oviraptor. The adorable dinosaur theme is a great fit for families who have dino-fans; in both the original and the expansion, the art is cartoony and cute--rather than realistic--but it is polished and well done. Dino Dude Ranch: Hatchlings expansion includes Egg tiles with an incubator tile to pile them on in the center of the table, Oviraptor tiles to go in the bag with the tiles from the base game, new Hired Hands cards that utilize the Eggs and Oviraptors, new bonus tiles using the Oviraptors, and rules cards to give instructions and help make game play easier. As with the original, the components are sturdy and well made--nice, thick chipboard for the tiles and linen finish for the cards. 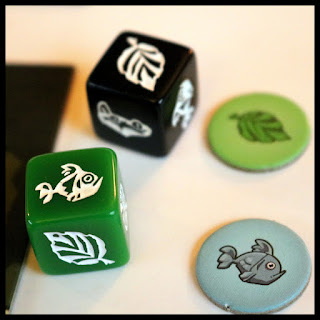 The artwork is cute and family-friendly as well as color-blind friendly (each color also aligns with a particular species of dinosaur, so the tokens are easy to tell apart). 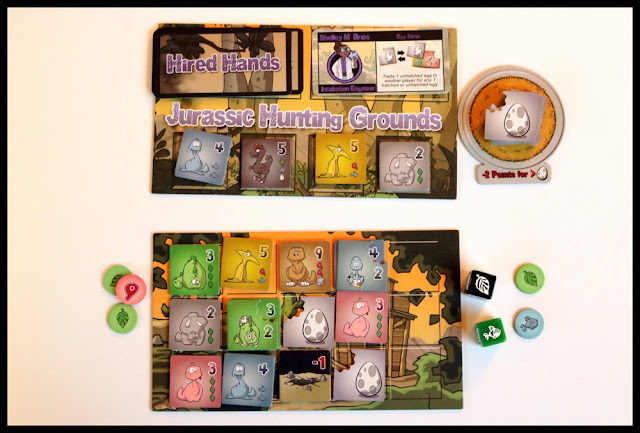 Set up begins by setting up the base game after shuffling in the Oviraptor tiles, new Hired Hand cards, and new Bonus cards. 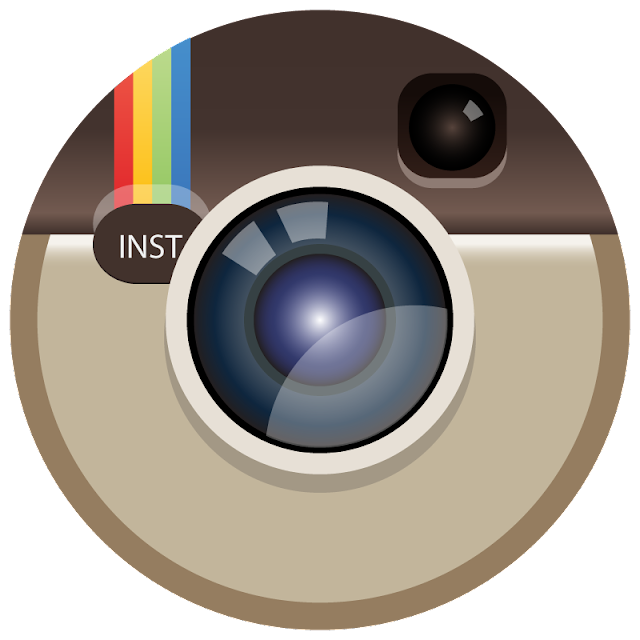 The Egg tiles are shuffled and placed in a pile on the Incubator in the center of the table and you're ready to go. 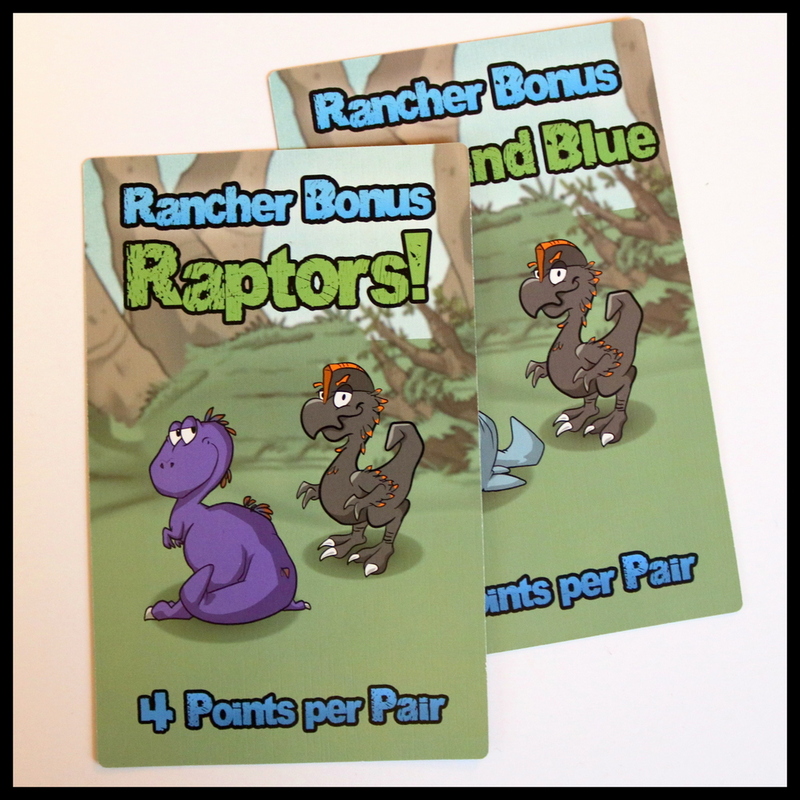 The base mechanics of Dino Dude Ranch are unchanged in the Hatchlings expansion: on your turn, you roll two dice to collect food, cards, or possibly fall into the tar pit. After rolling, you can use the food you have gathered to capture dinosaurs from the Jurassic Hunting Grounds in the middle of the table. 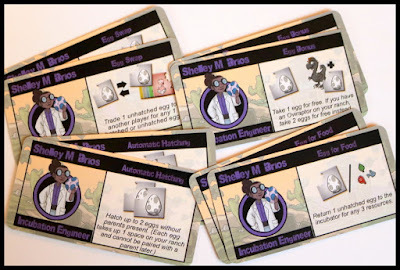 You can also choose to use some of your food to buy more Hired Hands cards to help you out, and you can play one of those cards per turn. 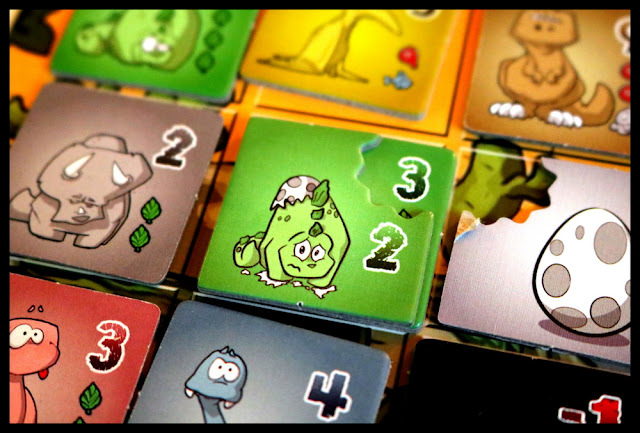 As the game goes on, you are trying to fill your Ranch board with the highest-valued dinosaurs and not let them sink into the tar! 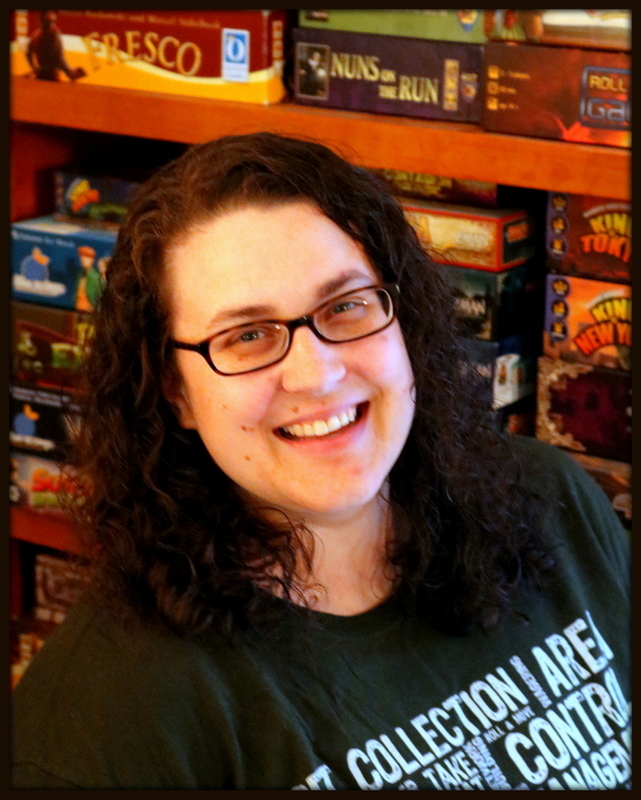 You'll get extra points if you meet the requirements on the Bonus Card you were dealt at the beginning of the game. The Hatchlings expansion adds the ability to use food to buy an egg. 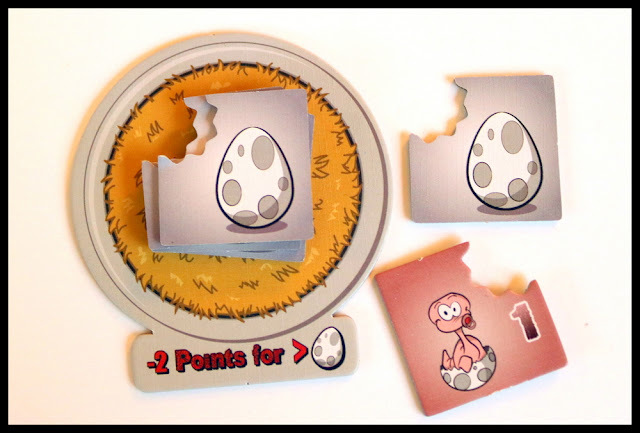 The egg takes up a space in your Ranch, but as soon as the parent dinosaur is present, you can hatch the egg (flipping the tile over to reveal the baby) and place the baby on top of the parent, freeing up a space in the Ranch for more tiles. The babies add 1-3 extra points to the value of your Ranch. 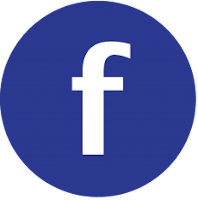 In addition, you can choose to sacrifice unhatched eggs to feed an Oviraptor from the Hunting Grounds and bring the dinosaur to your Ranch. 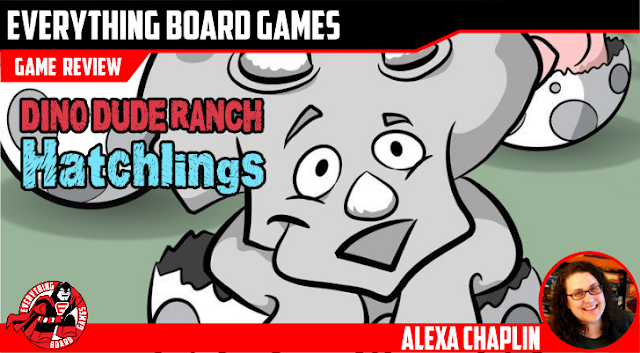 Be careful about keeping too many unhatched eggs, though, because not only do they use up a spot in your Ranch without giving you points, but the player with the most unhatched eggs at the end of the game will actually lose points! 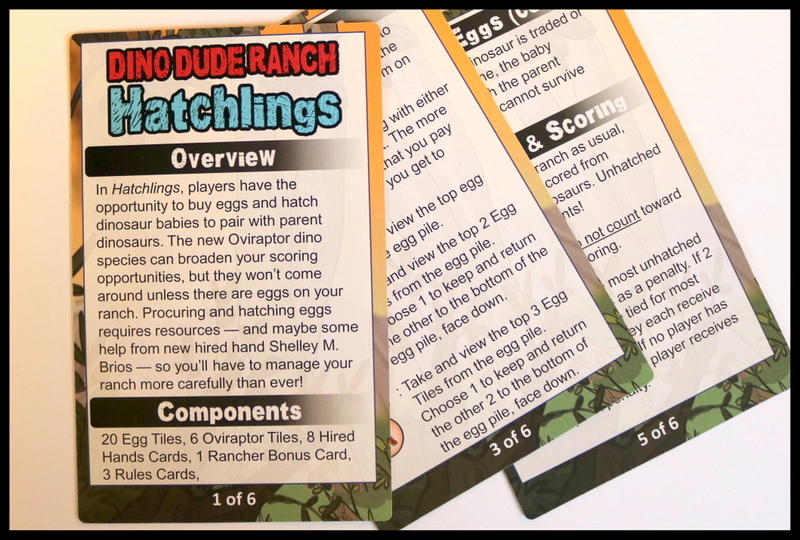 The addition of Egg tiles in Dino Dude Ranch: Hatchlings brings a little more complexity to a well-loved family game. 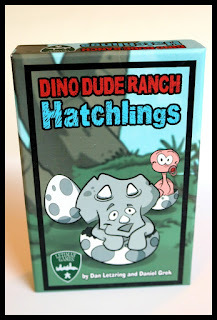 Dino Dude Ranch is a great starter game for kids or new gamers who are learning about set collection and resource management, and the Hatchlings expansion bumps it up to a new level. 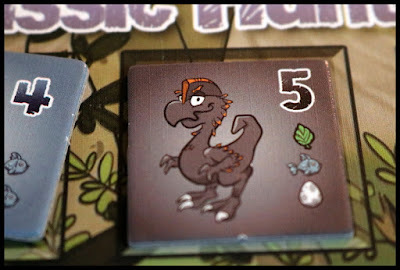 The choice to use Eggs as Hatchlings (for more points) or as food for Oviraptors (higher point dinos who also may be on your Bonus Card) adds an interested new bit of strategy to the game--especially because Eggs aren't free and have to be bought using the same food you could use to lure in a dino from the Hunting Grounds. The expansion added a little amount onto the setup, play through, and tear-down time for the game, and so we won't always use it; there will be times when we prefer a quicker experience, or something a little simpler for new players. Other than that, it's a light, family game, and that may not be everyone's cup of tea. 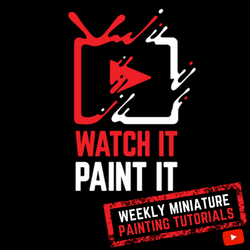 It's a good fit for us, but it might not be a good fit for you if you are hoping for something meatier than adorable dinos. 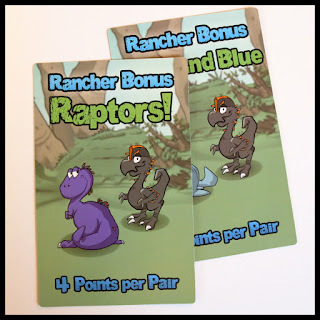 Families who enjoy set collection and resource management games on the lighter end, like King of Tokyo, Zooloretto, Catan or Catan: Junior will enjoy the adorable dinosaurs munching on food in Dino Dude Ranch: Hatchlings. 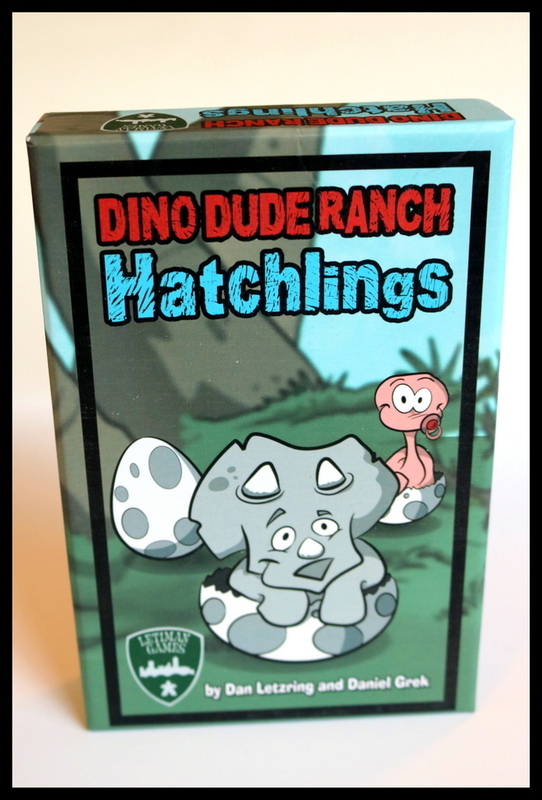 My family enjoyed the original Dino Dude Ranch and we eagerly anticipated a new species of dino and the ability to make babies. (I think my daughter's strategy is simply to fill her Ranch with babies because they're too cute to deny!) We enjoyed the added light strategy from the Hatchlings expansion and this is a keeper for our after-dinner game shelf.